Crag Hill - generally known as Eel Crag - lies in the centre of the picture, across Coledale, with Sail to it's left. 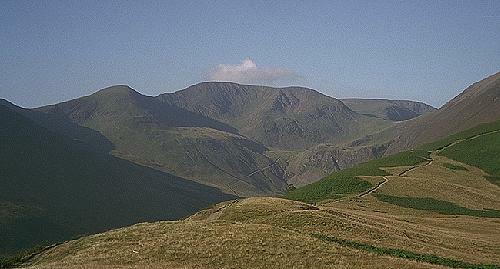 Eel Crag itself is seen on the fell's right flank, adjacent to Coledale Hause. Grasmoor appears through the gap. The clear path to the summit of Grisedale Pike is seen disappearing off to the right.